1/2" Inch (15mm) diaphragm pump for dosing and transferring of chemicals, acids and inks. Flow rates up to 57L/min and pressures up to 7 bar. Do you keep these AOD pumps in stock? Yes. 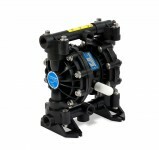 Global Pumps stocks a complete range of these diaphragm pumps in stock and ready for immediate shipping.